Directed by Andrew Niccol, staring Ethan Hawke, January Jones, Zoe Kravitz and Bruce Greenwood. 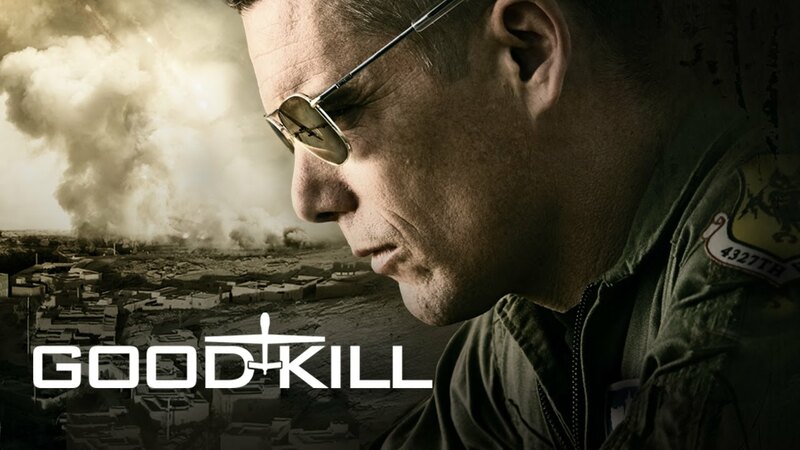 A former Jet pilot struggles to become accustomed to flying drones as his team challenges the ethical dilemma’s that present themselves throughout various missions. I am very much in two minds about this film. One half argues for the value of a film such as this, while the other struggles with the bleak desperation presented to us in ‘Good Kill’. From the start we are not given the American hyped version of drone warfare, indeed Greenwood’s character highlights this important aspect in a speech he gives to the new recruits. Ethane Hawke plays a struggling pilot coming to terms with no longer flying fighter jets and is instead placed thousands of miles away from the action and in the safety of the metal box from which he and his team control their drones. This is the narrative throughout with the only variable being his slow descension into anger and drink. While films can be bleak and depressing, this theme is served better when there is an actual purpose to it. Beyond explaining to the audience how miserable pilots seem to be unless you are a red blooded American wishing to kill as many foreigners as possible, then you will struggle coming to terms with your purpose within your job. So after the first hour or so you begin questioning where this narrative is taking you that you have not already seen in the first hour. There is one redeeming moment at the end of the film but this is overshadowed some what with the otherwise total darkness and lack of empathy we have towards our characters; baring January Jones and Greenwood who show some diversity to Ethan Hawke’s depression riddled character. OVERALL ** The purpose behind this film is clear, a presumed somewhat accurate description of life for drone pilots. However you cannot make a film this sourly depressing and long without more of a varied and purposed driven narrative. RECOMMENDATION – A good film in parts and interesting certainly as a window into the new way of fighting wars using technology that is quickly growing. This is incredibly depressing, which is my only warning to you.